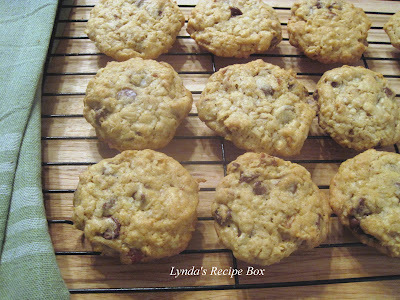 I don't know if you've had Cowboy Cookies, but they are chock full of goodies! Made with butter, flour and oats, they also contain nuts, chocolate chips and coconut for a real delicious treat. Some people make them a smaller size, like the picture above, where I measured the dough with a tablespoon. But very often I've seen them as a large cookie, where a 1/4 cup is used to measure the dough. Either way, they are wonderful treat and I've convinced myself that they are suitable for eating with my morning coffee! After all, they have lots of oats and nuts, which are healthy, right? Watch them closely as they bake as overbaking can cause them to be dry. They should be just turning golden around the edges and the center should be losing that shiny look. They will continue to set after coming out of the oven. Then you can eat them all; or not! Here's my recipe. Preheat the oven to 350 degrees. Cream the sugars with the butter. Add eggs and beat until fluffy. Stir in the vanilla. Combine flour, salt, baking powder and soda in a bowl. Add the dry ingredients to the butter mixture. When combined, add the oatmeal, chocolate chips and coconut and stir with a large spoon until all is combined. Dough will be crumbly. If making large cooies, measure the dough in a 1/4 measuring cup. Place on a baking sheet, 6 cookies to a large baking sheet. Flatten dough with the palm of your hand, or use the bottom of a glass. Bake in a 350 degree oven for 11-15 minutes, until slightly golden around the edges and set in the middle. Remove cookies from oven; let set on cookie sheet for 1 minute and then remove to cooling rack. If you prefer smaller cookies, use a tablespoon to measure the dough. 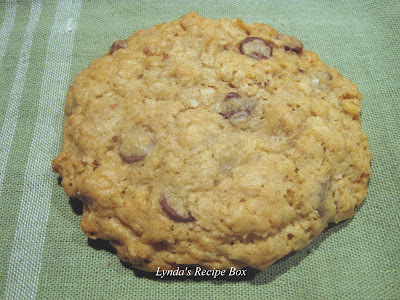 Place cookie dough on cookie sheet, flatten slightly and bake for 8-10 minutes. Follow rest of directions above. Enjoy! Man this sure looks like another gem for the recipe card box! Nice work! I would love to eat those cookies! I'm not a huge "sweets person", but cookies are my weakness! Will definitely be trying these! I would eat these for breakfast any day. These sound like something that my son-in-law just loves, but I forget what he calls them. Chock full of everything good! giddy-up! 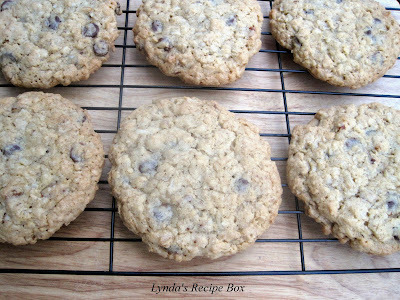 the oats are really key in these bad boys--they give such a nice chew! I love every component in it! Don't you just love old church cookbooks :) Never had a cowboy cookie and now feel a gap in my life as these look super good!! Oh, yeah, these are definitely a breakfast food, smiles! They look so good. I love that they are full of goodies.